Behold & Reflect: Asking Myself: How do you know when God is communicating with you? 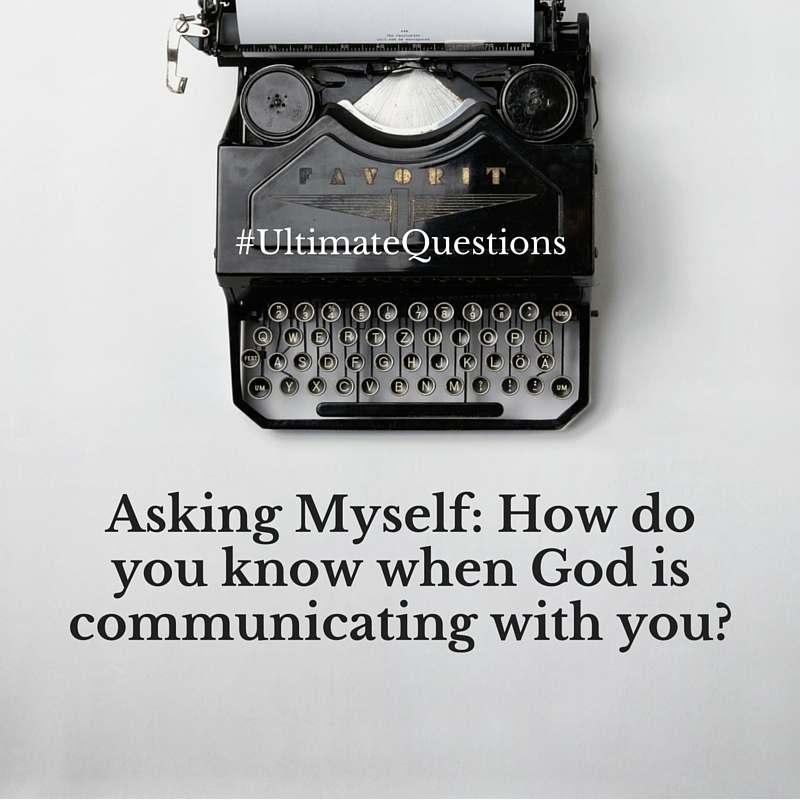 Asking Myself: How do you know when God is communicating with you? This is the 27th post in my series "Asking Myself," in which I weekly ponder one question posed in Teresa Blythe's rich book, 50 Ways to Pray. You can find the start of the series here and last week's post here. The first nine posts focused on theological musings, while posts 10 to 25 prayerfully consider the specific questions Jesus posed in the New Testament. Posts 26 to present focus on Questions on Spirituality. Q: How do you know when God is communicating with you? The short answer is I don't know. I mean, I often have a hunch, but I never really, truly know when what seems to be the universe conspiring to get my attention is actually God or a combination of coincidence and my own wishful or fretful thinking. The long answer is that, while I can never say with certainty (anymore) that God is communicating something particular to me, I do believe that the Holy Spirit speaks to my spirit. And for that reason, I tend to take note of certain nagging thoughts, ideas, urgings or understandings of myself or situation. On my best days, this quote gets me to pick up my phone and call a person whose face keeps popping into my head. It gets me doing, praying, connecting, creating, tending and caring. On the bad days, this quote guilts me into pleading for God's mercy, and patience. Asking him to "come again?" perhaps using another mode of communication so I might truly know it's Him. By nature, I often hesitate to "obey the impulses" precisely because I'm not always sure of their source. Deeply resonant truth can present itself in many forms: a solicited but admittedly hard word from a friend, or an unsolicited, refreshingly kind word from a stranger. It could be an idea from the depths of sleep-deprived musings in the dark of night or a wide-awake epiphany from the pages of scripture mingled with imagination. Truth can look like new understanding from a spiritual book or wisdom from a secular novel. He reaches even into metaphors from scientific observations in nature, or simply in randomness, seemingly out of the blue. And yet, any of these potential sources of truth can also produce equally strong unctions or ways of thinking that are not truth, that are not for anyone's benefit, and that are not from God's motions of life within me. So how do I know when God is communicating with me? It can't run contrary to basic morality as defined by scripture. It should be confirmed by older, wiser, trusted Christians familiar with the situation. Your own spirit or conscience should also affirm. Play the scenario out. Does the consequence of this action help you to love God and others more or does it cause harm or lead to sin? It's a good list. And if you feel yourself teetering on the edge of a dangerous impulse, I heartily recommend using these sorts of parameters to help reel yourself back in. No, you should not friend request your first childhood crush after a particularly bad fight with your husband. Check the list. But check boxes like these are mostly helpful for ruling out impulses that obviously do not arise from a spirit in tune with the Spirit. On more nuanced occasions, they can allow us to neglect to follow God's leading because the older, wiser Christians to which we've applied for wisdom are flawed human beings just like us. Worse yet, lists can enable us, in general, to feel like we already know all the things that God might be saying to us over the course of our lifetime... and those things sound an awful lot like whatever the main source of ministry/culture/or worldview in which we're steeped urges us to do or consider. It can give us permission "to refuse or neglect" the still, small voice; or turn a blind eye to the still, small sign language; or interpret as meaningless static the still, small cosmic Morse code or...however it is He communicates at any given moment. Back to Tozer in my wardrobe. The effect of his sage warning is that I find myself beseeching the Spirit not to be silent, but to keep trying to reach me. To patiently continue saying the same damn thing to me over and over and over, and in as many ways necessary until I get it. OK, maybe I don't swear when praying to the Spirit. But maybe sometimes I do. It's frustrating to not feel like I'm hearing God rightly. It's excruciating to be stuck in a holding pattern, afraid to act and afraid not to act for all my ambivalence about whatever it is I think I might have heard. And because I've asked, I assume He does answer. Therefore, I tend to consider a thought or idea might be from God when it shows up in a few different places, over a relatively short cluster of days and often from a variety of disparate sources. I'm going to take a risk and explore one specific possibly-from-God truth in my own experience. Lately, I've been wrestling with this thought: my underlying fear. and you're busy trying to micromanage everything around you. At first, and even still, her depiction of me seemed foreign, like someone I wouldn't recognize in the mirror. Or was I like that odd person in James who looks at himself in the mirror and forgets what he looks like seconds later? Am I faith without works? Am I all blog posts without substance?! I willed myself to keep holding my heart in this tension. I willed myself to believe that my friend had the best in mind for me, and I would just have to dig down deep to find that pearl, that balm of healing from tendencies of which I was only just made aware. I felt hopeful as we hung up. I had the space to figure this thing out. The conversation was blessedly private. I would pray and journal and seek God about it. I would peer into past memories and journal entries and try to reconstruct this new version of myself... to see what could be done, what could be rethought. There were so many other flaws and quirks in my character I wished to address, that these caught me a little by surprise. Yet, I still felt covered by my friend's honesty and good intentions... until the second message came. Out of the hundreds of people I've talked to, I've never seen anyone so full of fear. On a scale of one to 10, she's a 15. I say this because I'm concerned about her. There it was again. I have a problem with fear. But what on earth am I afraid of? And how come I don't sense this scale-transcending terror in my daily existence? And what am I to do about it? And are these people for real?!? God, is this for real? At this point, I was wondering if I might have anger issues more than fear issues, but in the days following, and once my temper-tantrum had subsided, I submitted myself to the most rigorous soul-searching I could muster. I journaled. I prayed. I listened. I took longer showers than necessary. I sought counsel from a close friend whom I see regularly, and she affirmed my suspicion that it's all the other people that are crazy. I sought counsel from a licensed counselor who has three years' experience dealing with trauma victims, who also expressed bafflement. I read a book on insecurity and took notes. I searched my memories, my motives, my actions. I applied my meticulous mind to unearthing possible roots of fear and acknowledging possible manifestations of it. It felt a little like I was going on a witch hunt in the wilderness of my own soul. And it felt God was completely mute on the subject. Now half-crazy with the fear that I might not even know how to identify my deep-seated fear if it bit me in the seat, I decided I would take a different tact. Taking a page out of my good friend's dissertation, (which I've had the privilege of editing; twice) I was going to view myself as in process. I was going to see my personality and identity as fluid. I was going to see that I was not yet who I am becoming. Furthermore, I would reframe my problem by renaming it something that would ring true. Instead of fear, I decided what I could embrace was insecurity, sensitivity, and at times anxiety. Now, if you're not a word-person, you might be shaking your head at me. You might be saying, Geesh, you don't see how those three things are like the EXACT SAME THING AS FEAR??? I will own up to being that meticulous micro-manager as an editor, especially when it comes to the accuracy of my word choice, but I will also gently argue that God made me this way. And just as the seemingly tiny difference in definitions get translated as something rather huge to my heart, I believe, as Beth Moore so beautifully says it, "it is huge to God on [my] behalf." When I reframed my issues with new words... it was like the floodgates of communication were open again. It seemed God was bringing to mind all sorts of past memories of "broken attachments" and miniature traumas that had lodged large in my heart. It was almost as if His previous silence on the matter was not because I'd done wrong, neglected to obey or heed the verdict of "FEAR" thus grieving Him into a vindictive silent treatment. Rather, it was that as I was consumed with these thoughts, I didn't have the right language with which to communicate with Him. He wasn't gonna talk to me in the voice and language and translation of the messengers who might have been obeying a God-given impulse to the best of their ability. No. The God who stooped to meet us by putting on humanity for 33.5 dusty, devastating years, will also graciously meet me by speaking my heart's unique, one-in-a-gazillion native tongue! Could this conclusion be the product of a proud heart, intent on hearing what it wants to hear in the way it wants to hear it? I admit it's possible. But I'm still in the process of listening. And I believe God is ever, always, still in the process of communicating. Next Week: In what life activities do you experience God's presence on a regular basis? A review of the NIrV "Minecrafters Bible"